Are you facing criminal charges? You need to get in contact with a criminal attorney immediately. At the Law Office of James Mendez, our lead attorney is a former prosecutor and has extensive trial experience and an impressive record of favorable verdicts. He is committed to providing the highest quality defense counsel in a range of criminal charges, from misdemeanor through to serious felony offenses. Quality counts in court. An attorney that doesn't take the time to really seek out the best possible defense may offer an ineffective defense and you could pay the price. When you are facing criminal accusations, it is not the time to take the risk of hiring an inexperienced lawyer. You need to have confidence that everything possible will be done for you, from the beginning of the criminal justice process. In some cases, after a thorough investigation of the evidence, he can identify holes in the case that are so serious that the charges can be dismissed or reduced. Defending a criminal case takes talent, effort and dedication. When you hire Mr. Mendez, you have an attorney fighting for you that spent years as a District Attorney. What better way to ensure that the best strategy is employed in your case? He knows the system, from both sides, and what the prosecutor will likely be doing. This allows him to craft a strategy with a higher possibility of success. Call the firm today. 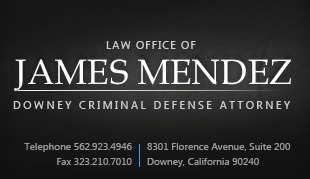 Contact a criminal lawyer from the Law Office of James Mendez today!